GEAR: Mountain Hardwear Effusion Jacket, Lole Sandy Jacket, Mountain Hardwear, Smith IOS Goggles, K2 Skis. 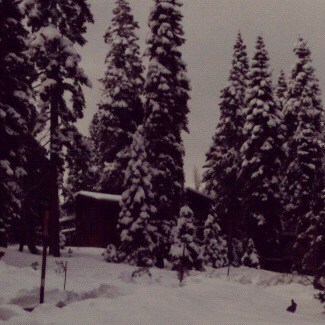 Finally the snow came back and made Tahoe feel like winter again. After a few backcountry outings on Friday and Saturday, Sunday was time to spend some time at home with my daughter and not rush off to ski so much. But, back to the skiing first. 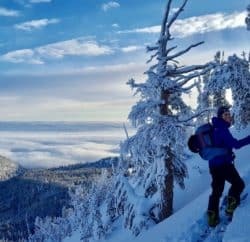 Randomly met up with Craig Dostie, author of EarnYourTurns.com, and we had a great hike and ski in the Mt Rose area on Saturday. It was still snowing lightly but the skiing conditions were perfect. 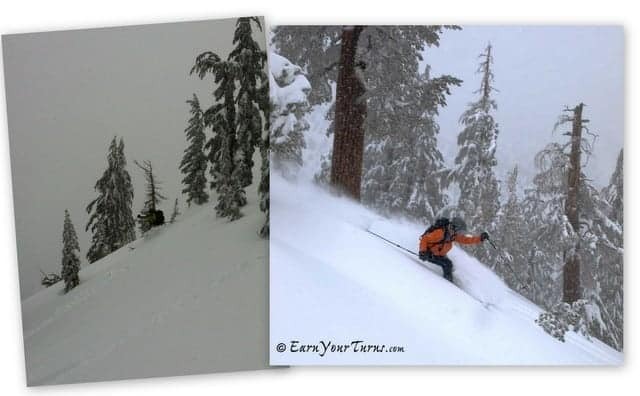 Here are a couple of shots of Craig on the way down and then a great one that Craig shot of me (orange jacket). On Sunday, it was time to take my daughter out sledding in this great snow, and she was a total trooper. 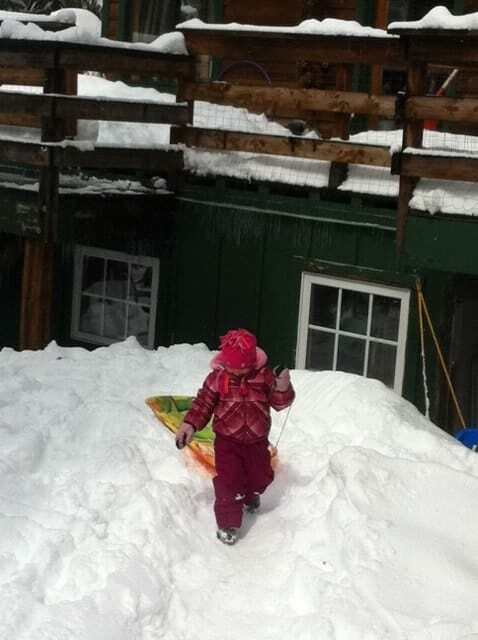 She even carried her own sled up the luge run that we built with our neighbors. I couldn’t get any of her huge smiles from her runs down because I was too busy making sure she didn’t crash into stuff at the end! Then, took the dog for a walk down on Kings Beach and caught these other 2 great shots. In one, you can see the snow hanging over the west side of the lake and quickly approaching Kings Beach; the other is showing just how much fun everybody was having with this new blanket of white, as these 2 guys from Europe were so happy they were skiing on the Kings Beach pier! The temptation of a true powder day was too much to pass up, even if I was coughing and sputtering my way out of a cold on Saturday. I wasn’t the only one who rallied for new snow at Alpine Meadows, so I decided to be content with lapping cut-up-but-still-soft powder on the lower mountain, leaving the longer lift lines for the bigger chairs to everyone else. Sherwood, the backside of the mountain hadn’t yet opened, and there was no indication of when it would, but I got a feeling late morning that I should be ready in case it did. 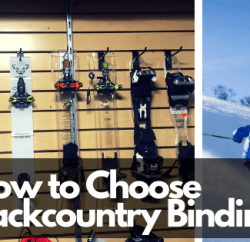 I got into a long line for Scott chair, which puts you into position to get to the back side, and ran into Justin, our Mountain Hardwear rep. He, I and a few others started traversing toward the back. And like magic, the word came that Sherwood was opening, and the handful of us in position went into a full-on stampede, landing us on the first few of chairs up above the still-untouched slope. The next five laps were the best of my season — fresh tracks, long, arching turns that my new K2 powder skis had been aching for all season — until the rest of civilization rushed over to join us. So one more steep line that drops from back to front through blower powder spraying up to my chest, and I was content. Back to nursing the cold, and wiping the huge grin off my face. 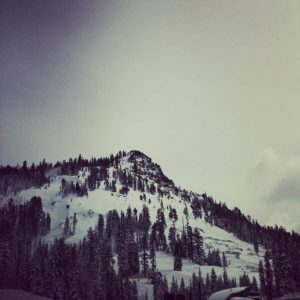 As for me, I got out to Alpine Meadows Saturday and Monday and had two great days, Monday by far being the best. Funny to hear Greyson’s tale of Saturday because I must have been a turn or two in front of or behind him that day. We too were hoping for Sherwood. We were lapping Scott and timed it perfectly, getting to the top of Scott right at the patroller flipped the sign. Our first two runs were beautiful! A pretty much vacant slope all to the few lucky ones. Then, on my third run, it began. Little ants covered the slope… and another run later and the Sherwood line was 10 minutes long. We pretty much called it a day after that, and I took this parting shot of Promised Land from the parking lot. 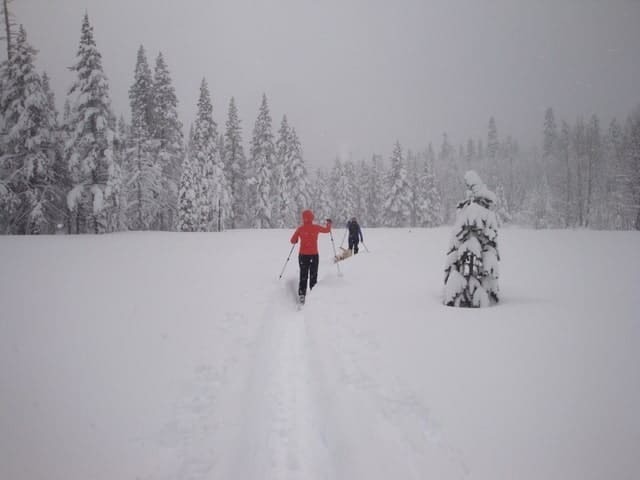 Sunday, I took the day off and went cross-country skiing with some friends and dogs. It was a winter wonderland! Light winds and a good dosage of snow made for some spectacular scenery. My Mountain Hardwear Effusion Jacket (in orange below) was perfect for the half-snow/half-sun conditions. And check out the difference between the trees on Saturday (above) and then the trees on Sunday (below). But Monday, oh Monday! I got to Alpine around 8:45am, and spent the whole day seeking out pow with some lady friends. Our first run was a quick Roundhouse lap because the Summit line was daunting from all the waiters, and there was so much fresh that it didn’t matter. Back down to Summit (no line this time) we shot straight over to High Yellow for amazingly light untracked powder. Here’s a peek from the High Yellow hike, looking toward F tree above Sherwood. We then hiked over to the just-opened Beaver Bowl but it was a hot mess with the sun baking the goodness out of it already. Hey, Alpine, how about opening at 8am in March?! We spent the rest of the day hanging around High Yellow and Arts Knob, and sneaking in some mellow low angle turns around Lakeview. It was a beautiful day… so sunny! Felt like a Tahoe spring day, with Colorado powder thrown in. I topped it off with $1.50 PBRs at Crest Cafe, then some hot-tubbing. Caught this snow bunny on camera by the hot tub. Thanks Miracle March! 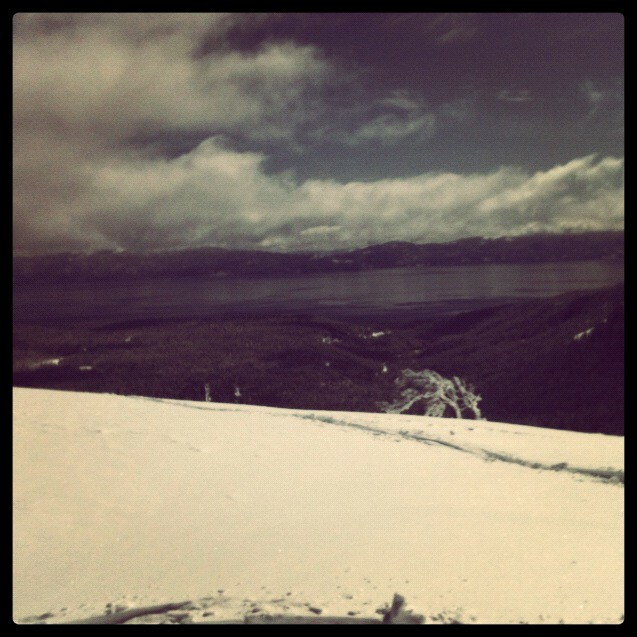 Tahoe snow was back! At least for a day. 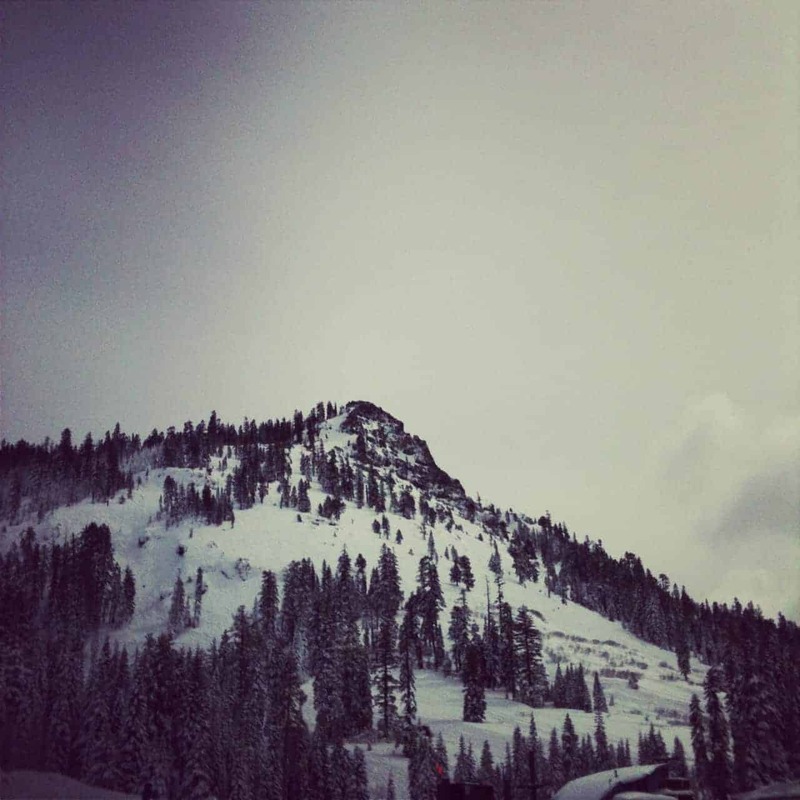 Yesterday’s warm temps put the Tahoe ski conditions right back where they started more or less.